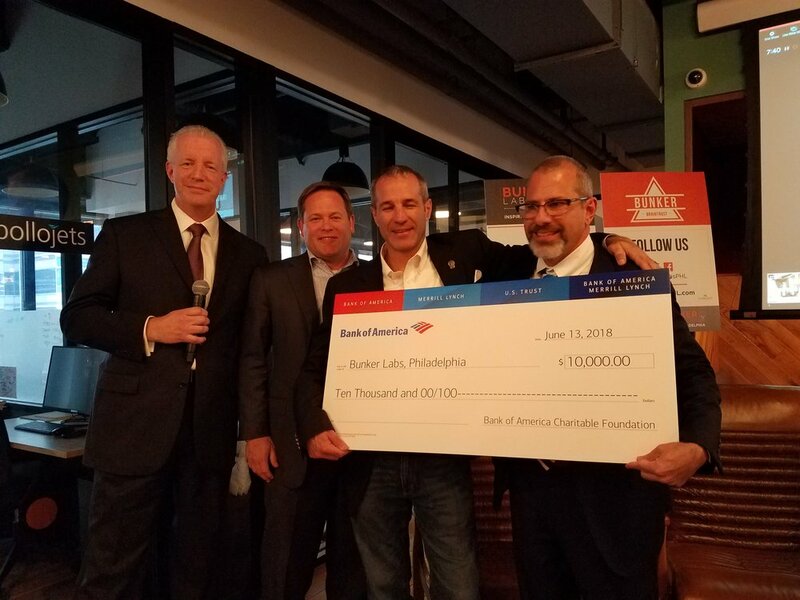 PHILADELPHIA, June 14, 2018 – Bunker Labs Philadelphia has received a $10,000 grant from Bank of America to support Launch Lab, helping Bunker Labs PHL to provide education, connections and mentoring to veteran entrepreneurs. All of these components are critical to veterans who want to start the challenging task of starting and operating a business. Editor’s Note: Photos are available from special check presentation taken June 13, 2018. Bunker Labs provides a variety of ways it supports veteran entrepreneurs beyond its Launch Lab programming. Bunker Labs also hosts a free monthly meet-up & happy hour called “Bunker Brews,” where the Bunker Labs community can network with subject matter experts, investors, leaders, and more. Another component is the “CEO Circle,” which offers a group of mentors and a community of support for Bunker Labs entrepreneurs who are further along in their business development process. In addition to the generous support of Bank of America, Bunker Labs PHL programming is made possible through contributions from companies like Comcast, Boeing, Lincoln Financial Foundation and Hussian College committed to supporting veteran entrepreneurs. Bunker Labs is a national not-for-profit organization built by military Veteran entrepreneurs to empower other military Veterans as leaders in innovation. Through local chapters organized in 18 different cities including Philadelphia, Bunker Labs provides educational programming, mentors, events, and thriving local networks to help military Veterans and their spouses start and grow businesses. Bunker Labs works to Inspire, Educate, and Connect veterans with the right resources and people locally to be successful, while also providing national tools and resources like: Launch Lab Online or Community Mobile App to support aspiring entrepreneurs where ever they may currently live or be stationed. For more information, please visit bunkerlabs.org or http://bunkerlabsphl.com/, follow us on Twitter @BunkerLabsPHL and #BunkerBuilds or like us on Facebook. At Bank of America, we’re guided by a common purpose to help make financial lives better, through the power of every connection. We’re delivering on this through responsible growth with a focus on our environmental, social and governance (ESG) leadership. ESG is embedded across our eight lines of business and reflects how we help fuel the global economy, build trust and credibility, and represent a company that people want to work for, invest in and do business with. It’s demonstrated in the inclusive and supportive workplace we create for our employees, the responsible products and services we offer our clients, and the impact we make around the world in helping local economies thrive. An important part of this work is forming strong partnerships with nonprofits and advocacy groups, such as community, consumer and environmental organizations, to bring together our collective networks and expertise to achieve greater impact. Learn more at about.bankofamerica.com, and connect with us on Twitter at @BofA_News.